As Parents of children with birth defects, the Parent Advisory Group is committed to helping our children and all those with birth defects live a happy and healthy life. We look for increased and continued research and surveillance that will lead to improved care and access to services and improve their quality and quantity of life. While we continue to work for the well-being of all those born with birth defects, we recognize the difficulties they face each day. 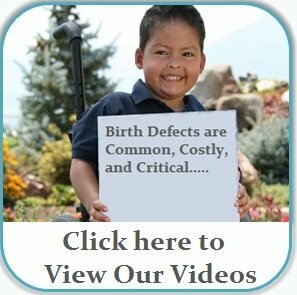 We recognized that birth defects are Common, Costly and Critical. One in every 33 babies is born with a birth defect and is the cause of one in five infant deaths. We call for a national commitment for increased surveillance, research, education and care. We advocate for change and for increased funding to support these goals so that someday, babies can be born without birth defects and that those currently living with birth defects can have access to the care resources needed to support full and productive lives.